When news came of the firing on Sumter, the Germans, under the leadership of Captain Nathaniel Lyon, secured the arsenal and arrested hundreds of the governor’s militia at Camp Jackson outside of St. Louis. For weeks after the overwhelmingly German volunteers had saved St. Louis from Governor Jackson’s machinations, the Germans of Missouri were the only effective Union force in that state. They organized patrols to keep the secessionists at bay, and offered support to Unionist refugees fleeing the southern part of the state. Even more importantly, they organized a political agenda that demanded that the federal authorities remove alleged pro-Southern army officers and send in troops from other states to help secure Missouri. To do this, they formed a political alliance with Missouri Congressman Frank Blair, whose brother was in Lincoln’s cabinet. 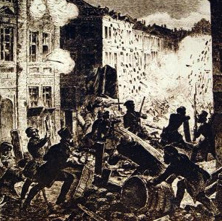 Street fighting in St. Louis in 1861. Lyon worked closely with pro-Union politician Frank Blair and with the military hero of the Germans, Franz Sigel. Sigel was a German military academy-trained professional soldier who had led democratic forces in Germany during the 1848 Revolution. On June 13, 1861, Lyon set off from St. Louis with 2,000 mostly German volunteers to throw Gov. Jackson and his armed supporters out of the state and destroy the insurrection in its earliest stage. Lyon’s crusade against the secessionists would be relentless. He would be hailed as a hero by the Germans, but his actions would irretrievably polarize the German Unionists from many native-born Missourians.